If you ever feel like you’re running in circles, you’re in good company. 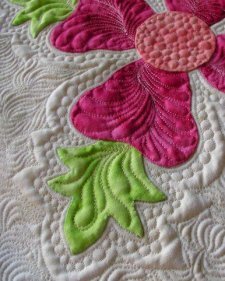 Wendy Sheppard of Ivory Spring shares a little Thread Talk about her foray into adding circles to her quilting projects. Is there anything more elegant than a string of pearls? 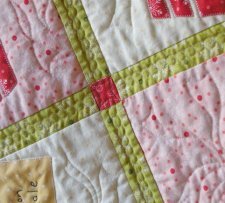 Wendy says quilting circles to form a “string of pearls” adds gorgeous detail to your quilt, “The pearls give the sashing strips a customized look.” It’s also great for sashing strips with narrow widths where you’d normally just quilt in the ditch. Adding circles is a great way to fill in empty spaces and the varying sizes tend to hide the occasional imperfecty stitched circle. Additionally, the circles add gorgeous texture and visual interest to any quilting project.